Here's the nation's only new coal plant. Is it the last? Finding America's only new coal-fired power plant means trekking nearly to the Arctic Circle. The University of Alaska, Fairbanks, hopes to complete work this May on a new 17-megawatt facility that will replace an existing 55-year-old coal plant as the source of power and heat for the nation's northernmost campus. "We're just working out some of the bugs right now so we can run continuously," said senior project manager Mike Ruckhaus. Fairbanks is thousands of miles removed from the wave of coal power shutdowns that keep rolling across the Lower 48. And coal advocates and their critics vehemently disagree if the first new U.S. plant since 2015 has anything to do with the future of coal in this country. University officials started looking to replace the old plant, built in 1964, when the boilers failed in 1998. "In the middle of the winter in Fairbanks, Alaska, when you lose your heating plant for 10 hours, that sort of gets your attention," Ruckhaus said. Outages continued, but the university did not settle on a $245 million plan until 2013. At a school famous for its climate change research, many students and staff balked at continued coal use. Although a lower emitter than its predecessor, the new facility will still release roughly as much carbon dioxide in a year as 26,000 cars. Two separate university studies explored at least 14 different fuel alternatives for the site. But in Fairbanks, wind is too infrequent, sunshine scarce come winter and pipelines for natural gas lacking. Even biomass and oil, both bountiful in Alaska, proved too expensive. But the state's only coal mine was just 100 miles away. "Coal remains the cheapest and most reliable fuel source," said Lorali Simon, spokeswoman for Usibelli Coal Mine Inc., which has always supplied the university's coal via rail from its eponymous mine near the town of Healy. Senate Energy and Natural Resources Chairwoman Lisa Murkowski (R-Alaska) met with Usibelli executives last year to discuss "the importance of coal" to powering Alaska's Interior, noting the new university plant. 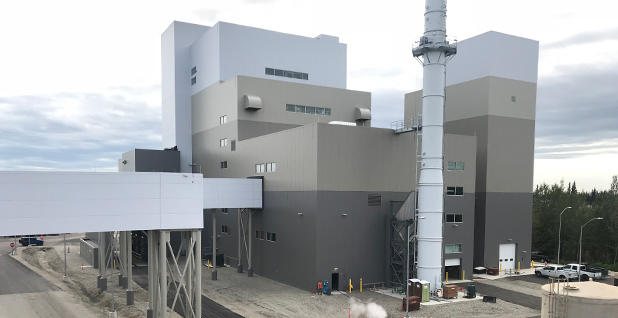 "The transition from their old facility to this new state-of-the-art plant aims to significantly reduce emissions — a positive step towards cleaner energy production for the university and Fairbanks," Murkowski said in a statement. Once a decision was made, the new plant had to meet air quality standards for particulate matter. As wood stoves remain common, Fairbanks has been an EPA nonattainment area for decades, but Ruckhaus said the new boilers are state of the art. Most of the plant's energy will go to heat the 71-acre campus. But with the university drawing about 8 to 9 megawatts of power, there is the potential to sell electricity to the local utility. Negotiations have begun, but the process will likely take another year, Ruckhaus said. The tiny Fairbanks facility pales in comparison to coal plant retirements nationally — 14,500 MW just last year. Yet, it is good news in an industry desperate for some. "This new coal unit helps to demonstrate that the next generation of the coal fleet will be able to increase efficiency, lower emissions, and compete against other fuel sources to provide reliable and affordable electricity," said American Coalition for Clean Coal Electricity President and CEO Michelle Bloodworth. ACCCE made that case in a report last month. The 10-page white paper calls for eliminating renewable and nuclear energy tax credits and state renewable portfolio standards to allow coal to compete. "Nearly 40 percent of the nation's coal fleet has retired or announced plans to retire," Bloodworth said. "Unless some of these retiring coal units are replaced with new coal plants, like what we are seeing in Alaska ... the nation will have lost an important fuel-secure electricity source." But Alaska just demonstrates how only "exceptional circumstances" justify new coal construction to Institute for Energy Economics & Financial Analysis analyst Seth Feaster. "It's the exception that proves the rule," Feaster said. Coal power does not make economic sense, Feaster said, if the only place it pencils out has almost no grid, little infrastructure and extreme environmental conditions. Grid operators have also ignored industry's calls for federal intervention in the name of "national security." "They sound like a bunch of radical socialists," Feaster said. "Why should ratepayers and taxpayers have to subsidize stuff when there's better alternatives out there?" he said. Plant closures have sent coal mining companies seeking refuge overseas. Coal exports reached their highest point since 2014 last year, according to the U.S. Energy Information Administration. Out of 116 million tons, 54 million tons were steam coal — the kind burned in power plants. But none came from Alaska as the Last Frontier bucked another national trend. Usibelli has not exported coal since halting shipments to South Korea, Chile and Japan in 2016. As a result, its coal production dropped from more than 2 million tons to 901,641 tons in 2018, leaving about 100 jobs at the largest year-round employer in the region. Even as global prices recovered, the Alaska Railroad Corp., the state-run owner of the only line connecting Usibelli to a port, had shifted away from coal. "Some capital needs to be laid out in order to get coal exports in Alaska running again," said the mine's spokeswoman Simon. For now, the family-owned company is focused on its "bread and butter" — six in-state customers including the university plant and Eielson Air Force Base near Fairbanks. "While we're very tiny on the global market as well as the national market," Simon said, "for the state of Alaska we provide a very integral part of the economy."